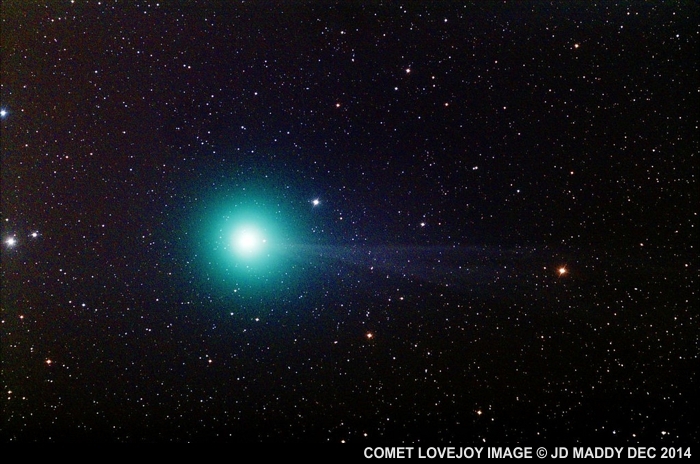 Comet Lovejoy, officially designated C/2014 Q2, arrived just in time to be called the “Christmas Comet” of 2014. It was discovered in August 2014 by Australian amateur Terry Lovejoy (this is his fifth comet discovery). It continues to brighten, and is favorably placed for viewing throughout the month of January for northern hemisphere observers. The image above was taken on December 26, 2014 by J.D. Maddy, President of the Astronomers of Verde Valley (AZ). It shows the comet in the constellation Columba (The Dove) at a brightness of about magnitude +5. It should continue brightening through January, possibly to magnitude +4 or brighter, passing closest to Earth on Jan 7 when it will be at a distance of 70 million km (44 million miles). After that, its intrinsic brightness should continue to increase until it reaches perihelion (closest point to the Sun) on Jan 30. From JD: This is a stack of 23 15-second exposures taken through my Celestron C14 Hyperstar at F1.9 on the AP1200 mount. I used a Canon Modified XSI (450D) to capture the images, which were later stacked with Deep Sky Stacker, and finally processed with GIMP2. Strong green light emission is due to the presence of cyanogen (CN) and diatomic carbon (C2) in the comet’s coma (the cloud of dust and gas surrounding the comet nucleus). The blue color of the ion tail, which points away from the Sun, is due to the presence of carbon monoxide ions (CO+). To locate the comet, look to the south around 9:30 pm (when the comet is culminating). It will be just west of the bright constellation Orion. See this chart for more details. You don’t need to know this to find the comet, but the date marks on that chart are for positions at 00:00 UT. To convert between your local clock time and UT, go here. You might be able to see this comet with the unaided eye. We don’t yet know just how bright it will get. At the time of this post, it’s easily visible through binoculars, or a telescope at low power (50-100x). But unless you have very dark skies, you’ll see the comet as “whitish-yellow” and not green. As always, more aperture → more light → better color perception. Disclaimer: Your eyes won’t see what JD’s image shows, even through a telescope. I located the comet using 10×80 binoculars two days ago, and it was still just a “smudge” of diffuse light. How much of a “tail” this comet will develop is anyone’s guess. Still, check it out and collect your late Christmas Comet gift.